Because you may update your app from time to time, you may also need to update some translations in your localization project’s Default Reference Language, to keep the strings between the app and the POEditor localization platform synced. If this happens, you will want to inform contributors about this change, so they will check that the translations in the other languages still correspond to the updated texts (i.e. the translations in the Default Reference Language that you updated, that you display across the localization project as terms, instead of labels). Using the Import in the Project Page: On the Project Page, click on Import Terms in the side menu, pick the language file that you want to use, select the option Also import translations in…, select the Default Reference Language (English in the screenshot) and then check the box to overwrite old translations. Another option will immediately appear, to mark corresponding translations from the other languages as fuzzy for the updated values – also check that one and press Import File. Using the Import in the Language Page: Go to the Language Page of the Default Reference Language set on your software localization project. 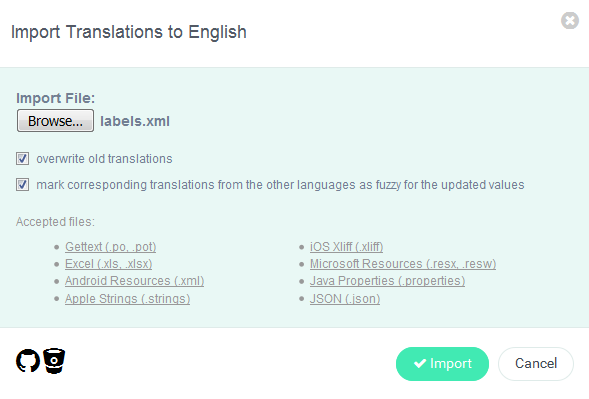 Click on Import Translations from File in the side menu, Browse for the language file you want to use for import, mark that you want to overwrite old translations and to mark corresponding translations from the other languages as fuzzy for the updated values and press Import. Use the Notify Contributors button in the side menu on the Project Page to tell contributors on a project level to review the fuzzy translations in the languages they are assigned to. 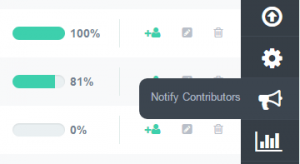 Contributors can then filter the translations in any Language Page so that the POEditor localization platform only shows the Fuzzy translations. This way, the updated translations in the Default Referance Language will be evident. After reviewing a fuzzy translation, any contributor (or anyone in the project) can use the Toggl Fuzzy Translation button (F button next to the translation) in the Language Page to remove the fuzzy flag. As a final consideration, keep in mind that you must be the owner of the software localization project, or one of its admins, to be able to mark as fuzzy the translations for the updated values. If you’re a contributor, you will not see this option when using the Import in the Language Page.